Hephaestus was one of the gods of the Greek pantheon; and indeed, in Ancient Greece, Hephaestus was regarded as one of the most important gods, and given an honoured place amongst the 12 Olympians. In Greek mythology, Hephaestus was god of fire and metalworking, but he is a Greek god that is often overlooked. The name of Hephaestus is not overly memorable, although his Roman equivalent, Vulcan, is more often remembered. In antiquity, Hephaestus was generally named as the son of the goddess Hera; and this is the lineage written down by Hesiod in the Theogony. Occasionally, other writers would name Zeus as the metalworking god’s father, but there is a particular Greek myth about the birth of Hephaestus that negates this. The famous story of the birth of Hephaestus tells of Hera bringing forth her son alone when she banged her hand on the ground. At the time Hera was said to be angry with her husband, for the goddess Athena had been “born” to Zeus, when she emerged fully formed and armoured from the head of the god. Having been born, it was soon apparent that Hephaestus was unlike any of the other Greek gods and goddesses of Mount Olympus. 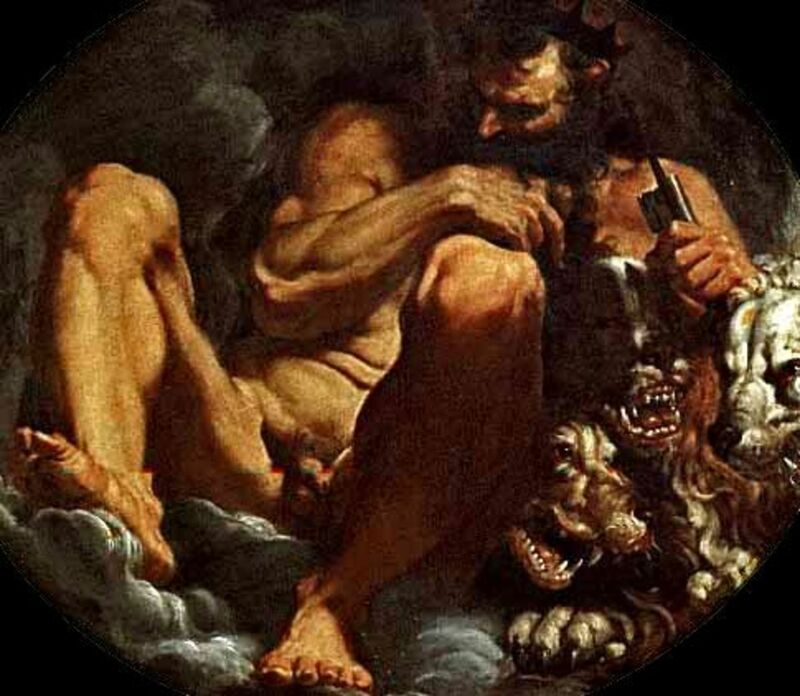 Greek deities were generally known for their beauty, but Hephaestus was definitely ugly in appearance. The appearance of Hephaestus is the normal reason given for his quick exile from Mount Olympus. The most common myth sees Hera throwing her son to earth; Hera being offended at the ugliness of her son, whilst she was regarded as one of the most beautiful of all goddesses. In an alternate version of the myth, it was Zeus who threw the son of Hera from Mount Olympus, as Hephaestus had rescued Hera from the golden chains that imprisoned her, suspended between heaven and earth. Zeus had been the one to tie up his wife, after the couple had had a violent argument. In either case, when Hephaestus was thrown out of Mount Olympus, the fall earthwards was said to have taken nine days. When Hephaestus landed on the earth though, he fell not onto solid ground, but fell into the sea near to the island of Lemnos. Two Oceanids, water nymphs, by the names of Eurynome and Thetis came to the exiled god’s rescue though. The pair nursed his injuries, the god having injured his leg permanently during the landing, and Hephaestus was then transported to Lemnos. On Lemnos Hephaestus discovered his purpose in life, for it soon became apparent that he was the most skilful of all craftsmen. On Lemnos, for nine years, Hephaestus would work with metal to produce the most beautiful jewellery ever created. Hephaestus would give the most beautiful pieces to the two Oceanids who had rescued him. 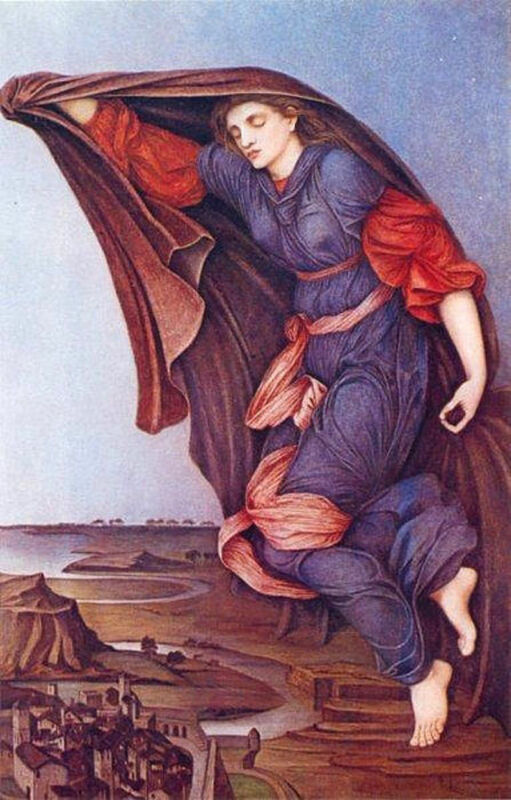 The beautiful work done by Hephaestus was then noticed by Hera, who now regretted the abandonment of her child, and wanted the metalworking god to create masterpieces for her. So Hera invited Hephaestus back to Mount Olympus, and the god accepted the invitation. Hephaestus though, had not forgiven his abandonment, and was plotting his revenge. In his workshop Hephaestus would design and craft the most beautiful throne ever built, a throne complete with intricate metalwork and magnificent jewels. Hephaestus then presented his mother with the throne. When Hera sat on the throne though, the throne trapped the goddess, making it impossible for Hera to move or escape. Hephaestus then departed Mount Olympus, and returned to Lemnos. The trapping of Hera would have normally been welcomed by Zeus and the other gods of Mount Olympus, but at the time, there was a need for Hera to be free. Envoys were dispatched to Hephaestus, and Zeus offered to make him one of the 12 Olympians if he were to free Hera; but Hephaestus dispatched the envoys, refusing to free his mother. Eventually Dionysus came up with a plan, and the Greek god of wine went to Lemnos and got Hephaestus drunk, and then, upon the back of a mule, transported the god back to Mount Olympus. When on Mount Olympus, Hephaestus would eventually agree to release his mother, for the god was promised the hand in marriage of Aphrodite; so the ugliest of gods was married to one of the most beautiful goddesses. The marriage between Hephaestus and Aphrodite would actually aid Zeus as well, for fact that Aphrodite had previously not been married was causing conflict amongst other gods and goddesses. The arrangement though did not suit Aphrodite, and the Greek goddess of beauty did not want to be tied to such an ugly god. Soon, Aphrodite started an affair with Ares, the god war, but the relationship did not stay hidden from Hephaestus for long. Hephaestus manufactured an unbreakable chain net, and when he caught Aphrodite and Ares in flagrante, he threw the net over them. Hephaestus would then drag the pair of naked deities back to Mount Olympus to expose the unfaithfulness of Aphrodite. The other gods and goddesses though did not take the matter of adultery too seriously though, and simply laughed at the nakedness of Ares and Aphrodite. 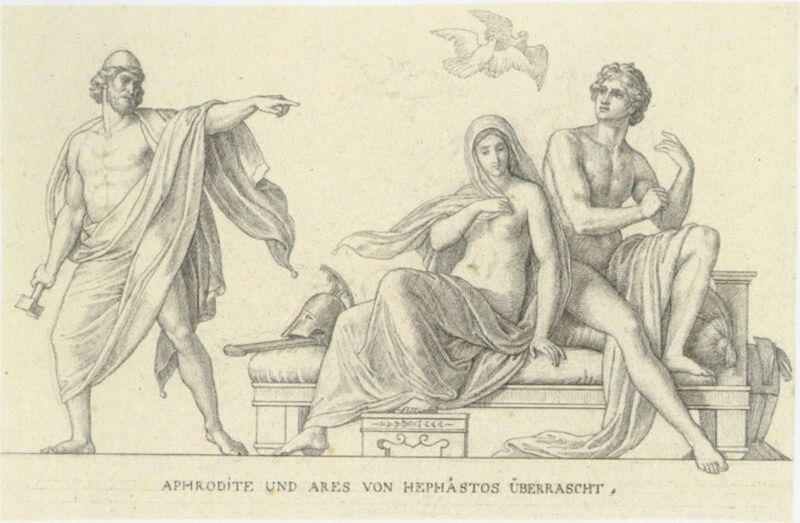 Of course, Hephaestus himself was not monogamous, although his appearance did make him less of a catch than Aphrodite. Hephaestus was linked with the sea-nymph Cabeiro, with whom, he would become father to the two Cabeiri, additional Greek metalworking gods. Two more sons were born to Thalia, these being the Palici. 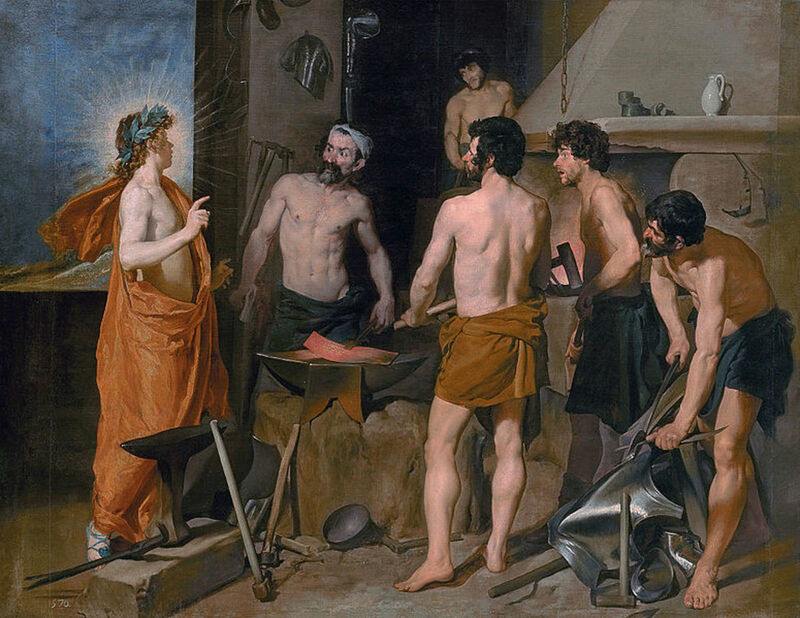 Hephaestus was though also famously rejected by Athena, for as the metalworking god attempted to mate with her, she pulled away, and the seed of Hephaestus fell to earth, and Erechtheus, the archaic king of Athens was born. Hephaestus was said to have had a number of workshops scattered around the ancient world, and the one on Lemnos, and one beneath Mount Etna were prominent in Greek myth. Hephaestus though also had a forge and workshop upon Mount Olympus, and the output from Hephaestus’ workshops were in great demand. The gates of Olympus were constructed by the god, as were many of the fixtures and fittings of the god’s palaces. Hephaestus though, would become particularly known for the weapons that he crafted. 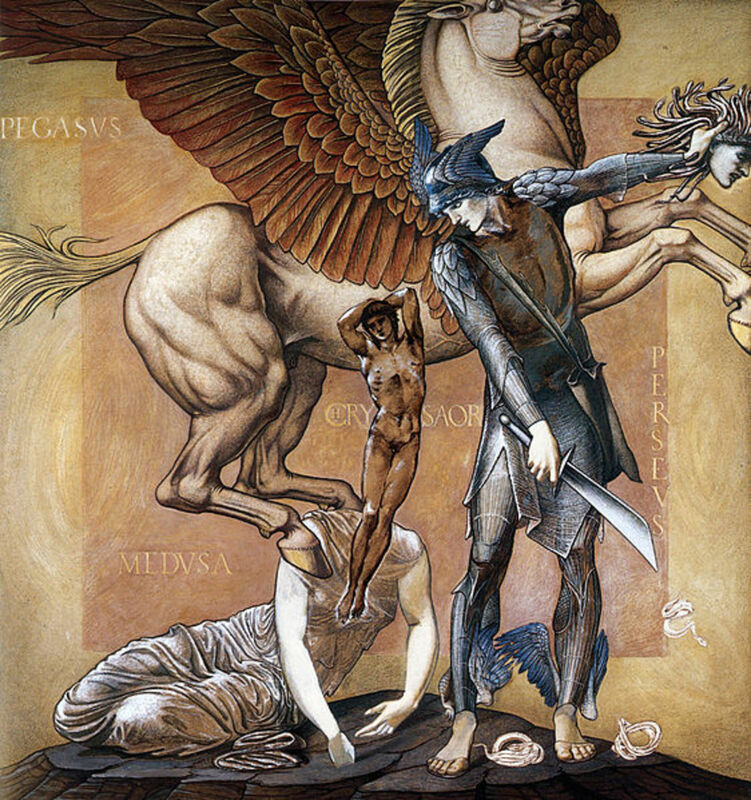 The metalworking god was credited with the manufacture of the breastplate and sceptre of Zeus; the winged helmet and sandals of Hermes; the chariot of Helios; the shield of Athena; the bow and arrows of Eros; and the girdle of Aphrodite. The weapons of Hephaestus though also found their way to many famous mortals; for the god also crafted the armour of Achilles, the staff of Agamemnon and the bronze clappers of Heracles. 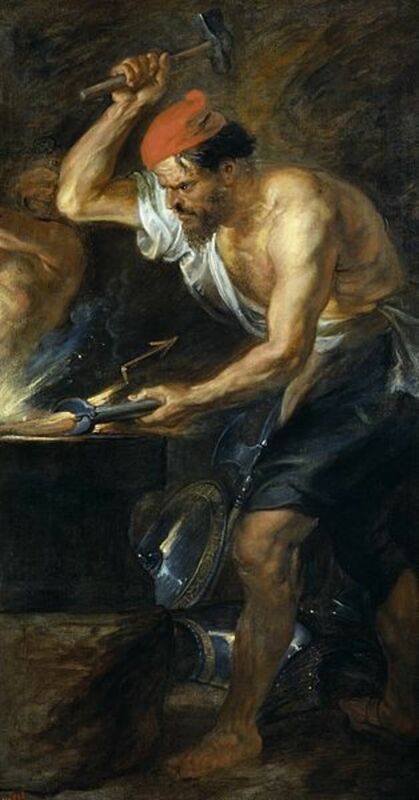 Hephaestus did not do all the work himself though, for he was assisted at the forge by the three, first generation Cyclops, the sons of Ouranus, who had previously crafted weapons for Zeus, Hades and Poseidon. Hephaestus would also craft male and female automatons to assist him in the workshop and away from it. Hephaestus would also create tripod automatons to assist Ganymede and Hebe in the serving of ambrosia and nectar at the banquets of the gods. It was of course, from the workshop of Hephaestus that Prometheus would steal the secret of fire, which was subsequently presented to mankind. 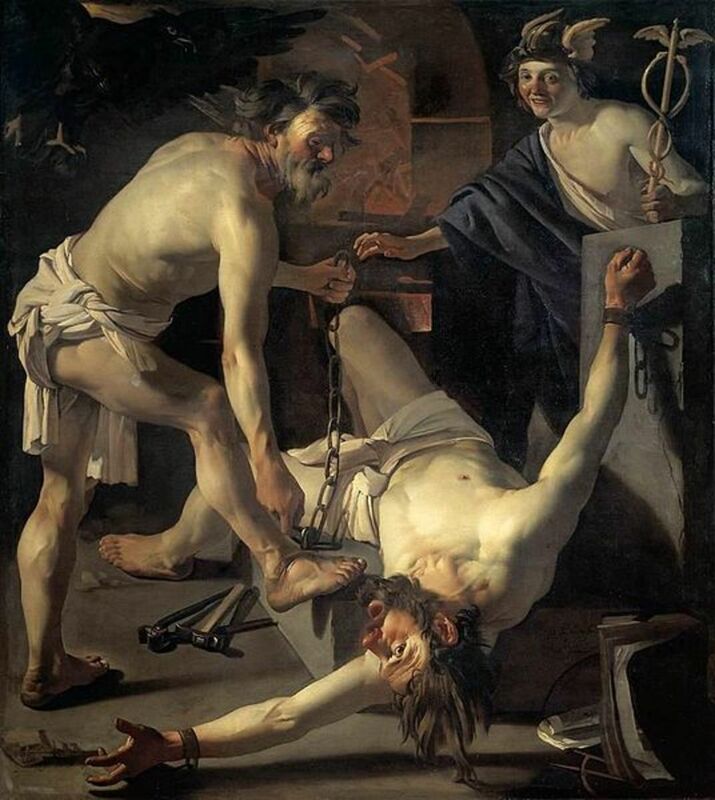 Hephaestus was therefore involved in the retribution of Zeus, for Hephaestus would create Pandora, the woman presented to Epimetheus, and later he would chain Prometheus to the mountain. Wow, the myths are so elaborate and, of course, full of contradictions, like the Bible. Many thanks for reading and commenting as always. Colin. You tell these stories very well, Colin. I like that. Interesting and enthralling. 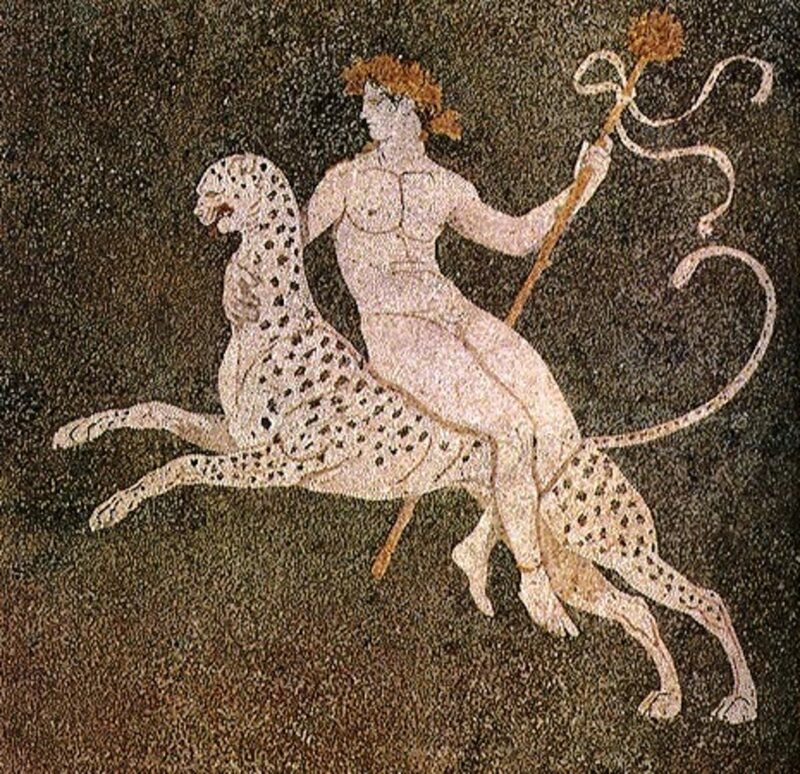 Many thanks for reading and commenting MK, I too find Greek myths fascinating. Colin.